India's industrial production growth remained sluggish in September dragged down by a decline in mining, capital goods and weakness in manufacturing output. Economists cautioned that the temporary impact of the demonetisation of some high value currency notes on consumption could hurt expansion in the quarters ahead. Industrial output rose annual 0.7% in September. 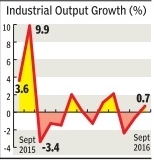 Industrial output contracted 0.1% compared to a growth of 4% in the year earlier period.